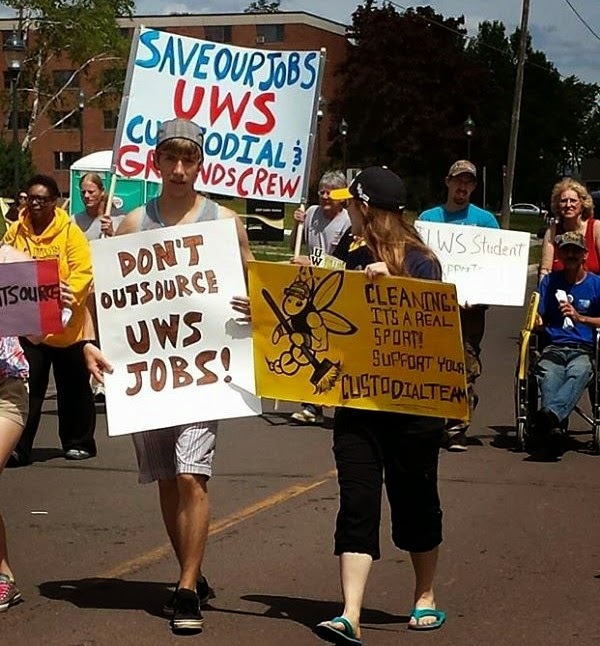 Today there was a welcome back event at the University of Wisconsin-Superior for faculty and staff. In solidarity with the janitors whose jobs are threatened with outsourcing, supporters handed out hundreds of leaflets and stickers to what proved to be a very receptive audience. During the "Town Hall" session of the event we delievered the 5,000 petition signatures, that we've gathered on behalf of the janitors, to the embarassed UWS Chancellor. A big thank you to everyone who helped to today, and to the hundreds who proudly wore the solidarity stickers!